Relaxing under the stars sounds like a magical way to spend the evening. Of course, then you would have to be outside and that’s not always possible. If you want that star look but inside the comfort of your own room, check out the Glow in the Dark Canopy. This whimsical and soft canopy puts a beautiful star lit night above your head as soon as you lie down. This airy canopy is hung under the bed and is created with sheer material and glow in the dark stars. Not very complex but the effect is quite nice. You could get a bit techier by adding LED lights and a power source if you want to go the DIY route. 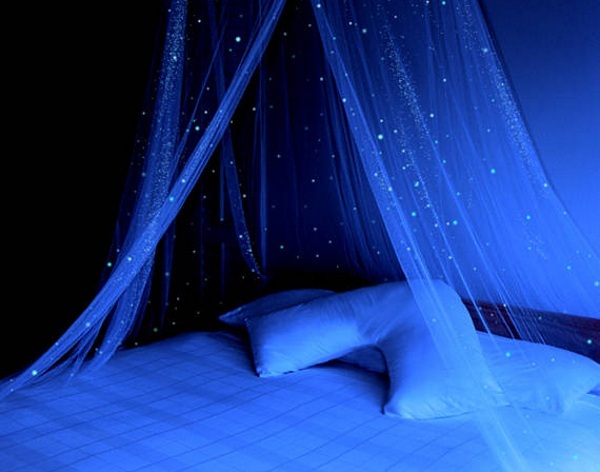 The netting also doubles as an insect net so you can sleep soundly all night, protected by your own blanket of stars. Form and function. Prices start at $82.63.